Officer Steven Keith, perhaps the epitome of an effective foot patrol officer, used to walk the beat on 24th Street. Last August, the San Francisco Police Department announced plans to nearly double the number of foot patrol officers walking commercial corridors citywide from roughly 70 to 130. Moreover, Police Chief Bill Scott said the number of foot patrols would quadruple in the Mission District. But nearly five months later, merchants along the Mission District corridors that the foot beat officers are supposed to be patrolling, say the foot-patrol presence has been inconsistent at best — and nonexistent at worst. Residents ask for foot patrols at nearly every community meeting, and they have long been considered key to community policing. 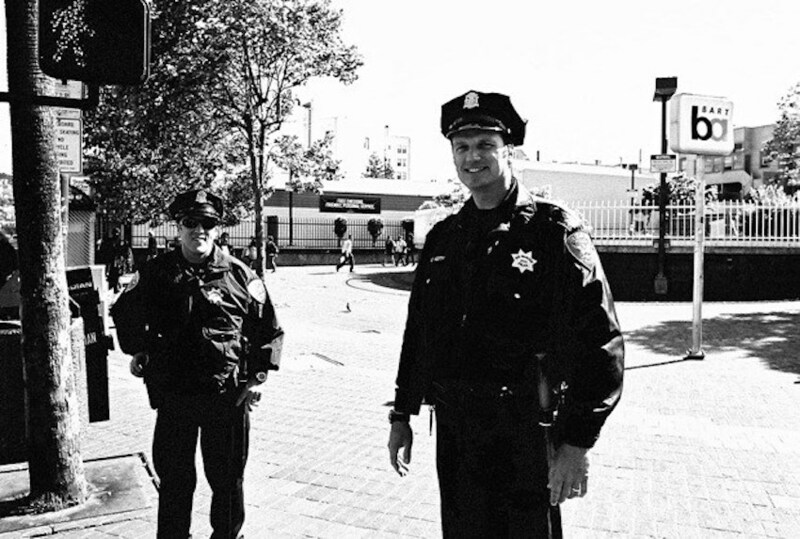 In its report on the San Francisco Police Department, the Department of Justice underscored the benefits of foot patrols that engage with the community in a positive manner. To do so, however, police have to engage. Mission Local recently interviewed two dozen businesses along Mission and 24th streets to understand how the foot beat officers operate — how frequently they patrol the corridors, how they engage with store owners, and whether they are affecting the public’s sense of safety. Of the 25 people interviewed, only two said they saw an officer on foot daily, and both businesses were located next to the 16th Street BART Plaza. Meanwhile, 11 people said they never saw foot-patrol officers, while 12 people said they see foot patrols about once or twice a week. Mission Captain Gaetano Caltagirone, who took over the Mission Police Station in October — in part because of his experience with foot beats — said the foot patrols are deployed on 24th and Mission streets every day. The officers, he said, are supposed to engage with store owners. He said merchants should be remembering the officers, and he could not explain why most merchants said they did not. “That’s something I have to look into,” he said. 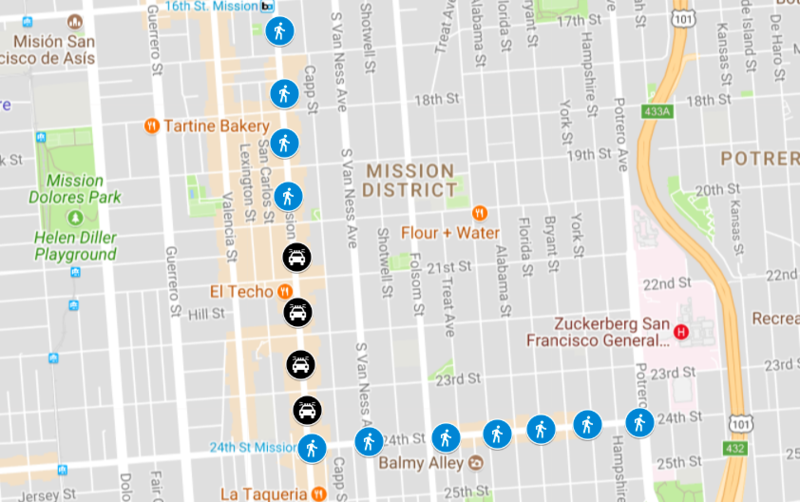 In theory, two officers are dedicated to the two corridors for 14 hours a day — from 9 a.m. to 11 p.m. One team should be on 24th Street from Mission to Potrero Avenue, and the other should be on Mission Street between 16th and 20th streets. The Captain said that because of limited staff, a sector car patrols Mission Street between 20th and 24th. “In a perfect world, I would like to have a cop on every block, but that’s not gonna happen,” he said. On 24th Street, Caltagirone assigned two regular patrols — Officers Celendenen and Condon — as well as some rotating officers to fill in when the regular patrols are unavailable, he said. But, unlike 24th, there are no specific officers that patrol Mission Street, largely because of staffing issues, he said. Nevertheless, the officers are out there, he said. Caltagirone said that the merchants interviewed by Mission Local could be missing the times the officers walk past their stores. Beat officers can spend a significant time away from their patrol after making an arrest, he said. Few merchants, however, reported either seeing the foot-patrol officers on duty or engaging with them. Annie Luo, who runs a Chinese food restaurant on 17th and Mission streets, spends much of her workday standing in front of a window that overlooks Mission Street. Luo believes that a more consistent foot patrol presence is the only way to make a real difference in crime. “They should come two or three times a day to let people know they’re an actual presence,” she said. Subscribe to the Mission District Police Station’s Newsletter here. And read the latest newsletter here. The January police community meeting is Tuesday at 6 p.m. at the Mission District station at 630 Valencia St. Meanwhile, on 24th Street, many merchants said they rarely see foot patrols, but remembered a time when they were more regular. “Today I didn’t see them, yesterday I didn’t see them, last week I didn’t see them,” said Denise Gonzalez, owner of a Mexican crafts store. “I want to know when they come,” she said, asking for their schedule. Likewise, Martha Andrade, who has worked at a hair salon on 24th Street for more than 20 years, said she rarely sees the patrols. James Dong, who owns an outdoor store on 24th, said he remembers officers walking into his store a couple of times — once immediately following the September rollout, and another time near Halloween, when officers dropped off a flyer for an event. Dong said he wants to see more patrols from 4 p.m. to 8 p.m. “A lot of stuff happens at night,” he said. Under the current 9 a.m. to 11 p.m. schedule, they should be out there, but he is not seeing them. The one place foot patrols appear to have a consistent presence is at the 16th Street BART plaza. Ahmed Alkableny, who works at a smoke shop at 16th and Mission, said he regularly sees foot patrols around the plaza, but in the last couple months has noticed a decline in their presence. Alkableny said engagement used to be much higher. “A year ago, they would come by more and check,” he said. Banossee Tatom, a security guard at an apartment building that overlooks the plaza, said he sees the two patrols, sometimes more, every other day. “Sometimes they post up across the street, sometimes they walk up and down,” he said, noting that he usually sees them patrol Mission between 16th and 17th. Tatom said having the officers patrol the 16th and Mission intersection makes his job easier. “There’s a lot that goes on — drug users and dealers – it’s a lot,” he said. “You need the manpower to make those things happen,” he said. If you have met your local beat patrol officer, let us know. We would like to post names and photos so that residents will introduce themselves.